AMP Electrical - Blog - Buying a home? Would you buy a car without service history or MOT? The answer, should be NO. Then why do thousands of Homebuyers purchase properties, without checking the electrical installation first? Faulty and dated wiring is one of the main causes of electrical fires in the home. The risk of this can be prevented by checking the condition of the electrical installation regularly by carrying out an Electrical Installation Condition Report. An Electrical Installation Condition Report or EICR for short; is an inspection on the condition of an existing electrical installation, to identify any deficiencies against the national safety standard for electrical installations. In layman’s terms ,it’s the equivalent of an MOT on a property. Although an EICR is not yet government legislation, as a Gas Safety check is, too many home buyers are neglecting the importance to have an electrical test performed at the same time. You run the risk of not knowing about any potential, or, existing electrical dangers that may be waiting behind the front door. Once the dotted line is signed, it is too late. This could prove to be a costly experience, when all could have been identified by carrying out an EICR. Over many years, we have carried out a vast amount of EICR ’s. We perform these for local estate agents, and, advised customers, who, with our education as a professional, are beginning to see the importance of this procedure. 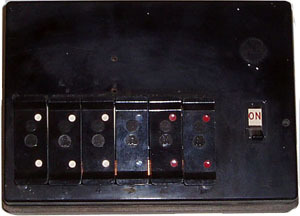 Dated consumer unit,as displayed at the top of this blog. Old round pin sockets and switches and accessories. This blog is not a sales pitch, but purely to raise awareness with homebuyers, the importance to carry out an EICR, before committing to a sale. More information on this subject, and a detailed description of the process of an EICR, can be found at our sub page Inspection and Testing. AMP Electrical and Maintenance Services Ltd. Follow us on our reloaction journey!